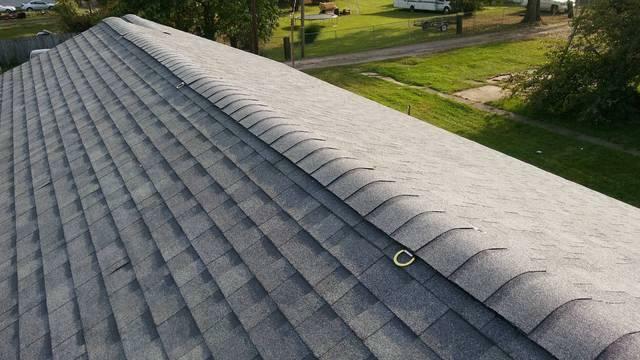 On a typical asphalt roof, the ridge vents have a layer of shingle over them, as shown in this photo. The vent lets the warm air out of the attic and out of this ridge vent. Most people don't know about ridge ventilation, which makes sense, because most people just want the roof leaking to stop and be dry. But it's an important thing to not overlook, because it can lower your utility costs, improve your living conditions in the home, and can even extend the life of your shingles too. Here at Bone Dry Roofing we install and fix ridge vents and other roof vents too. We're the trusted experts in Greater Columbus because we're offered roof repair, roof replacement and more for many years to our customers, at affordable prices. Contact us today to start your FREE estimate in Columbus, Hilliard, Dublin and throughout Ohio. The specialists at Bone Dry Roofing can help you choose the right type of roof vents for your home. We can repair or install roof vents and improve your attic ventilation. We offer all our professional roofing services throughout Greater Columbus, including Columbus, Hilliard, Dublin, Newark, Lancaster, Grove City, Westerville, Delaware, Pickerington, Reynoldsburg and nearby. Call us at 1-844-385-9722 to get a free quote on any of your roofing needs.